Make a distinct fashion statement and by wearing this kurta from Soch. Featuring a round neck, it looks smart. 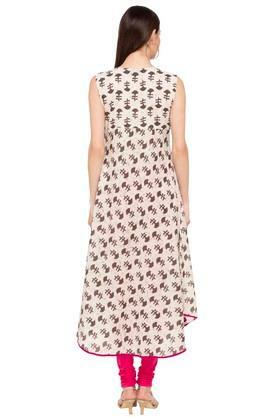 Besides, it comes with a print pattern that gives it a classy look while the sleeveless design adds to its overall look. On the other hand, it will keep you at ease throughout the day, as it has been crafted from good quality fabric. Score high on the fashion meter by wearing this printed kurta. Ideal for casual outings, it will go well with a matching pair of leggings and heeled sandals.